Second Edition Hearts & Souls Coming Soon! 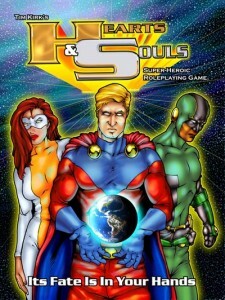 Hearts & Souls is a complete superhero role-playing game that takes you back to the comic books. Its “Drive” based system makes the reason your character is a hero more important to success than stats and dice. First Edition Print available via Lulu: Click on the cover to proceed. 6″ x 9″ 133 page B&W hardcover. Only $25.00 USD – Get your copy now! Hearts & Souls also available as a PDF from your finer electronic game distributors. It is a way to answer the question: Why are you a hero? So why would you do it? Were your parents murdered callously for some unscrupulous criminal to get his hands on their enormous wealth? Do you feel responsible for powers beyond your fellow man? Choose a drive, make it what matters, and be a hero. Join the Hearts & Souls mailing list here.